Don’t panic The Essential Revision … in a Hurry series provides you with outlines of the key topics you’ll need to know to successfully pass your exams. “Corporate Finance” covers key topics in this area with a step-by-step introduction to the most commonly examined principles. Throughout the book, there are tests and practice examples that ensure that you have a clear understanding of the material and are able to put the theory you have learned into practice. The book is split into three main sections: Investments Risk and risk management Long-term financing Each section is broken down into short, manageable chunks that clearly explore core areas within the sections as well as show how they fit into the bigger picture. Written primarily for undergraduates and postgraduates on their first courses in Corporate Finance, the book will also be of use to those taking professional exams or as a refresher for students taking higher level courses that include an element of corporate finance. Don’t panic! 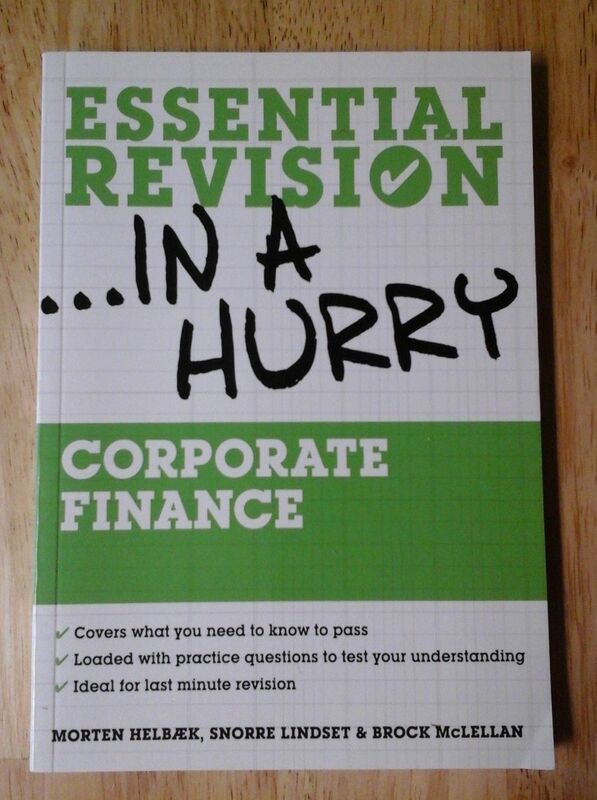 The Essential Revision … in a Hurry series provides you with outlines of the key topics you’ll need to know to successfully pass your exams.Corporate Financecovers key topics in this area with a step-by-step introduction to the most commonly examined principles. Throughout the book, there are tests and practice examples that ensure that you have a clear understanding of the material and are able to put the theory you have learned into practice.The book is split into three main sections: Investments Risk and risk management Long-term financing Each section is broken down into short, manageable chunks that clearly explore core areas within the sections as well as show how they fit into the bigger picture.Written primarily for undergraduates and postgraduates on their first courses in Corporate Finance, the book will also be of use to those taking professional exams or as a refresher for students taking higher level courses that include an element of corporate finance. Many topics in finance are hard for students to understand. Corporate Finance: get it, read it, PASS is a short revision text presenting the essentials that students have to learn to pass their Coporate Finance module. This book will teach students difficult theory and show them how to solve challenging problems in an effective way, using as few words as possible. It will include demonstrative examples with complete solutions.